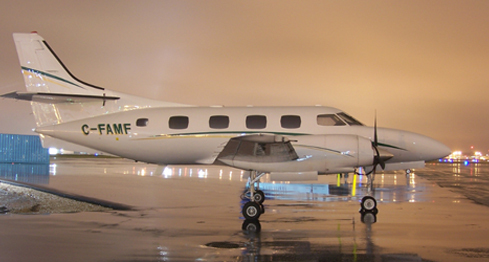 The Merlin is a shortened executive-class version of the Fairchild Metroliner, capable of transporting up to 6 passengers per flight. With a cruising speed of 315 mph, and a range of 1700 statute miles, the Merlin is the fastest aircraft with the longest flight range in our fleet. It is easily capable of flying non-stop to any destination in North America, including airstrips with short gravel runways in adverse weather conditions. Passenger amenities include all-leather interior, private lavatory, and full refreshment center (catering service is also available upon request). Payload For a 900 statute mile trip the payload is 1,770lbs. For every additional 100SM, reduce payload by 250lbs.